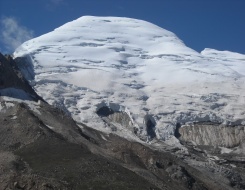 Kedar Dome is a mountain peak in the Gangotri group of mountains. Gangotri group falls under the famous Garhwal Himalayas of Uttarakhand. Kedarnath peak also belongs to the Gangotri range of mountains. Kedar Dome lies 2 km from the Northwest side of the Kedarnath peak. Both the peaks surround the Gangotri glacier at two sides. Kedarnath Peak is higher than the Kedar Dome. Kedar Dome can be reached from the northwest side comparatively more easily than the eastern side. The eastern side of Kedar Dome is a treacherous climb. Hence the northwest side is the route which is basically used by the trekkers. At the height of 16000 feet lies the base camp of the Kedar Dome which is known as Khara Pathar. The altitude doesn’t seem to increase very sharply and the trek is also relatively short, but the air gets thinner. In the spring season the track becomes an attractive site for people to ski. Upon arrival at Delhi airport met our representative and then transfer to hotel by AC Car. Overnight at hotel. In the morning after breakfast transfer to IMF for briefing & equipment check and later drive to Rishikesh via Haridwar. On arrival transfer to hotel. Evening free to explore the nearby area by your own. Overnight stay at hotel. Rishikesh: Situated at the foothills of Garhwal hills along Ganges, Rishikesh is a gateway to the important religious places of Badrinath, Gangotri, Kedarnath and Yamunotri. Places of interest includes visit to Bharat Mandir- the oldest temple in Rishikesh, Nilkanth Mahadev-this is believed to be the place where Lord Shiva drank the poison churn out of the cosmic ocean among many other temples. Also visit some of its many Ashrams: Ashrams are centers for spiritual studies, meditation, Yoga, sacred prayers besides being residential centers for the resident gurus. Morning after breakfast proceed for Uttarkashi (1150 mt), which takes 5-6 hrs drive. Upon arrival check-in at Hotel. Evening free to explore the surrounding by your own. Overnight stay at hotel. Uttarkashi is the principle town in the region. Nehru Institute of Mountaineering is situated here. It is also the gateway to many mountaineering and trekking expedition in Gangotri area. The day is for documentation. One can explore this beautiful hill town. Overnight at hotel. Day 5 Uttarkashi - Gangotri (3048 m/ 10,000 ft) Drive (95 kms). Morning after breakfast drive to reach Gangotri via Harsil (approx 25 km before Gangotri (3048 mt) by covering approx 95 km in 4-5 hrs. On arrival check-into Hotel. Overnight stay. There is a beautiful Gorge at Bhairon Ghati over which there is a steel guarder bridge. Gangotri is the place where the Goddess Ganga descended on Earth from Heaven. There is a Temple of Goddess Ganga where thousands of devotees throng to pay homage to her. Gangotri: The shrine of Gangotri is situated at an elevation of 3200 m surrounded by deodars and pines. The original temple was constructed by the Gorkha General Amar Singh Thapa. Every year people from all around the world visit this shrine. A number of ashrams and dharamshalas are located on the other side of the river. It is believed that Raja Bhagirath used to worship Shiva on a slab of rock "Bhagirath Shila" situated near the temple. Submerged in the river there is a natural Shivling where, according to mythology, Lord Shiva sat when he received the Goddess Ganga in his matted locks. A days trek takes one to Gomukh, the source of the mighty Ganges. Morning after breakfast we commands our trek further to Bhojwassa via Chirbasa (3600mt). From Gangotri we move along the beaten track towards Chirbasa, which is on tree line. The entire trek today is along the roaring Bhagirathi River. Beyond Chirbasa the terrain becomes really desolate and barren. In fact, it has been referred to as Artic Tundra by many trekkers. From Chirbasa we trek further to Bhojwassa, the entire trail passes through dense forest, Arrive Bhojwassa, there is a small temple and a potential campsite near down the river. We make our camp near river side. Afternoon free to explore the area and to enjoy excellent sunset on Bhagirathi group of peaks. Dinner and overnight stay in tents. After breakfast trek down to Gangotri and from here drive to Uttarkashi. On arrival check in to hotel. Overnight stay. Today we will take a drive to Rishikesh. Overnight at hotel. In the morning after breakfast drive to Delhi. On arrival check in to hotel. By evening group will enjoy dinner at Restaurant with Peak Adventure Manager. Overnight stay at hotel. • Accommodation: Hotel in Delhi, Rishikesh, Uttarkashi on twin sharing basis with breakfast. While on trek & Expedition we will provide you Dome/Alpine/High Altitude tents on twin sharing basis. Camping mattresses, kitchen tent, dining tent, camping stool, camping table etc would be provided. • Meals: In Delhi, Rishikesh, Uttarkashi only breakfast will serve. While on trek all meals will be provided. Meals will be freshly prepared and will be a mix of Indian, Chinese & Continental. • LAP & HAP: For carrying camping equipment, rations, vegetables and some amount of personal gear of the clients (one bag not weighing more than 20 kgs). Peak Adventure Tours Invites You To Fly Your Flag On An Indian Summit!! !